3V Underwear manufactures underwear of high quality and environment friendly Bamboo fabrics. Our company is a global market leading starter in the clothing and fashion industry to value sustainability and environment as high as functionality and design of sophisticated clothing primarily prefered by well-dressed and fashion focussed men. Trendy on top! The main product line focuses on deep V Neck T-Shirts, a must for every gentleman. Our products will be made available by online shopping only, with a primary aim to to make (online) shopping for gents as easy, pleasant and efficient as possible. Online Luxury and Life Style Magazine Aspicio Luxuria published an article in it's Summer 2013 edition about a trend in men's fashion that is characterized by the female attraction for the men’s cleavage. Among a display of luxury concepts such as LifestyleHouse, the Porsche 911 Carrera 4S Facebook and Absolut Vodka, 3V Underwear is presented as a trendy Wannahave for every well-dressed gentleman and weekend Club visitor. 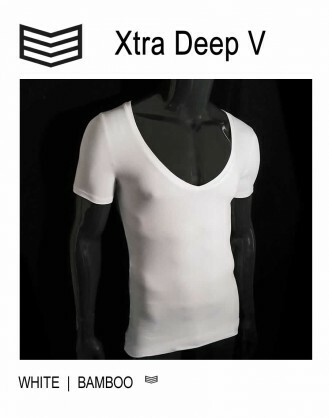 3V Underwear started in August this year with a product line of high quality and trendy deep v neck t shirts in three different v neck depths. Aspicio Luxuria invited 3V Underwear for an interview. Aspicio Luxuria (ALmagazine.nl) is a contemporary modern and fully digital design and luxury lifestyle magazine. With only products and services of the highest class in the world today, combined with reports of events and crafts, we give you a glimpse into the world of high society.